The arena of Photovoltaics is currently being bombarded with numerous, and indeed ambitious, research activities, all of which strive to enhance the efficiency of available technologies. Previously, we talked about perovskite solar cells, whose low manufacturing cost and high power conversion efficiency can easily rival that of the commercially available varieties. 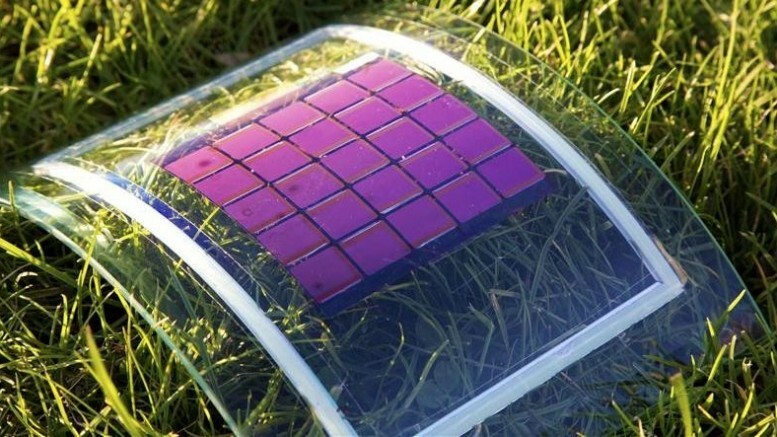 This time around, a group of scientists at the University of Cambridge has developed a complex hybrid material that can drastically improve the photovoltaic efficiency of solar cells. A traditional silicon solar cell is fundamentally limited in its power conversion efficiency, because a lot of the energy absorbed is high-energy light that is wasted as heat…We are proposing to coat traditional silicon solar cells with an organic layer. The idea is to distribute the energy of incoming high-energy photons into two triplet excitons and to transfer their electron on to silicon. Consisting of a composite mix of pentacene(an organic semiconductor) and nanocrystals of the inorganic compound, lead selenide(PbSe), this specially-engineered organic coating is based on a technology that has never been used before. Unlike traditional solar cells that utilize the energy of spin-singlet excitons, this organic material has successfully managed to harvest electrons, and therefore electricity, from ‘dark’ spin-triplet excitons, at an efficiency of 100-percent! In a solar cell, the absorption of photons from the sun actually leads to the production of excited states, known as excitons. The formation of excitons is followed by their dissociation, which usually occurs when they reach the positive-negative interfaces. Consequently, the separation of charges at the interface results in the deposition of positive charges at the anode and negative charges at the cathode. Electricity is generated when these opposing charges are passed through an external circuit. The excitons, which play a major role in determining the conversion efficiency of a photovoltaic cell, are of two different kinds. While spin-singlet excitons are the ones most commonly utilized by traditional solar panels, harnessing the energy of spin-triplet exciton-producing photons ensures much higher efficiency. The only problems is that triplet-excitons have a higher electron spin, which makes collecting their energy somewhat difficult. The key to making a better solar cell is to be able to extract the electrons from these dark triplet excitons… If we can combine materials like pentacene with conventional semiconductors like silicon, it would allow us to break through the fundamental ceiling on the efficiency of solar cells. This fundamental limitation, with regards to the efficiency of PV cells, is called Shockley-Quessier limit, which actually explains why the efficiency of most solar cells never exceeds the 20-percent mark. However, Tabachnyk is confident that, with further developments, the spin-triplet exciton-based solar cell will attain a power conversion efficiency of, no less than, 46-percent! Our goal is to first develop a prototype of such a hybrid solar cells that is more efficient than a conventional silicon device…For silicon to make use of the excitations, their energy needs to be higher than the bandgap [minimum absorption energy] of silicon. This is why pentacene is not a suitable candidate for silicon. However, we have been successfully working on an alternative organic that can do just that.